With much of the east coast of America already developed, the United States government wanted to encourage people to move out west. They decided to help people out by offering them free land through a law called the Homestead Act. The Homestead Act became law in 1862 when it was signed by President Abraham Lincoln. Under the new law a U.S. Citizen could get 160 acres of unoccupied land west of the Mississippi River and east of the Rocky Mountains. They could keep the land if they lived on the land for five years and made improvements to the land. Homesteading was a great opportunity for many people, especially immigrants just moving to the United States. Anyone who was over 21 years old could own land. This included former slaves, immigrants, and single women. Different areas of land were opened for homesteading at different times. This often created land rushes where people would race in to claim the best plots of land. 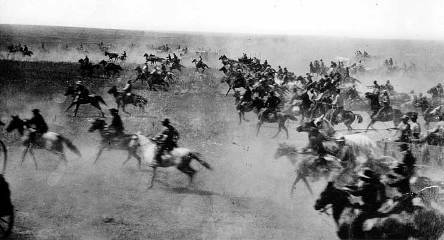 One of the major land rushes occurred in Oklahoma on April 22, 1889. Around 50,000 people lined up to claim around 2,000,000 acres of prime land. At high noon they were allowed to enter the area and claim the land. Some people snuck onto the land early and hid in order to lay claim to best areas of land first. These people were nicknamed "Sooners". Today the mascot for the University of Oklahoma is the Sooner. Around 10,000 homesteaders settled around the area that is today Oklahoma City. The next day, April 23, 1889, the city was established with a population of over 10,000 people. It would later become the capital of the state of Oklahoma. Northerners wanted the land to be developed by small farmers rather than the large plantation owners from the South. They were afraid the plantation owners would use slaves to farm the land. There was an $18 fee to file the application to get a plot of land. Later Homestead Acts allowed for 320 acres in areas for dryland farming and 640 acres for ranching. By 1934, 270 million acres of land had been given away by the United States government. That's around 10 percent of the entire United States. Homesteading ended in 1976, except in Alaska where it ended in 1986. In the book Little House on the Prairie, Laura Ingalls' dad claims a homestead in Kansas.